Hello my friends! Odie updating today. I am typing this early because we should raising the tent in Richton, Mississippi this morning. I hope you had super week. We had an amazing time in Millry, Alabama. I am sure that next week we will have some pictures of the tent coming down in Millry and going back up in Richton. Pastor Lamar Chapman and Midway Assembly did a great job hosting the revival this week. The people of Millry really want to see their community won to Christ. It is wonderful to work with folks hungry for more of God! Many area churches were very supportive of revival. We are thankful for all the local help! It was a huge boost to us. The Lord met us in a special way each service! Thank you all for your prayers for revival in Millry. The weather was warm but bearable. The rain held off and we were able to have all seven services under the tent. That was a huge blessing in light of the forecast for heavy storms early in the week. Several months ago I came across the site of Ian and Larissa Murphy. I do not know them personally but their story has encouraged me. Their resolve has strengthened my faith in God. On 8/28/2010 they were able to fulfill their dream of marriage. On 8/28/2014 their book released. You can read a free chapter and buy the book at the link. 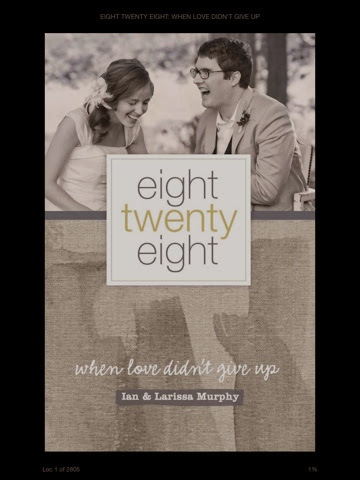 Eight Twenty Eight When Love Didn't Give Up is a story of dedication, determination and devotion. I shed several tears while reading the book. To me it is a blessing when I can be reminded that I can overcome overwhelming obstacles! I am reminded again that there are others out there whose battle is way tougher than mine. I have a ton to be thankful for! I appreciate Ian and Larissa sharing their story. I am praying for them. Ian and Larissa, you inspire me! Have a terrific weekend. May God bless all of you!